Elizabeth and I get a lot of satisfaction out of finding new uses for everyday items. 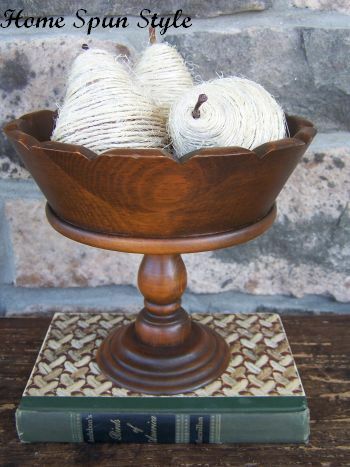 Recently, while thrifting, I purchased a wooden pedestal bowl that was filled with plastic fruit. I was about to leave the fruit behind when a friendly shopper said “Oh I think the fruit comes with it”. So, rather than tell her how much I dislike fake fruit, I took it home along with my “real” treasures. 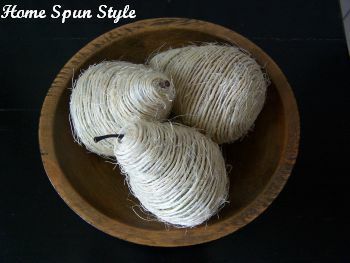 After cleaning and photographing the bowl for our etsy shop, I decided to experiment with the plastic pears by covering them with some plain old jute twine. 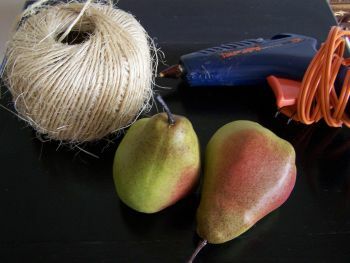 Using my hot glue gun I started at the top of the pear and began applying the glue around the pear and then pressing the twine into the glue. 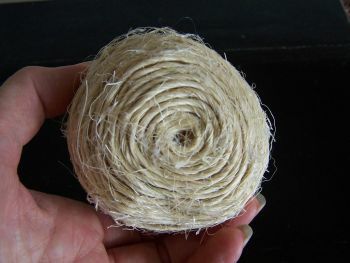 I kept the rows as close as I could get them and pressed in on the twine to follow the contours of the pear. I continued the process ending in the center of the bottom of the pear. Actually, this was a project that sat on my kitchen counter for a few days, which I kept coming back to whenever I had a few minutes to heat up my glue gun and wrap a few more rows. I’m pleased with how they turned out. I like their new textural quality and neutral color. While I stuck with pears, I’m sure plastic apples would turn out equally as well.